Reflections on consciousness, society and values may take the individual through myriad of theoretical considerations, ranging from purely speculative to the concrete and substantially observable. Such reflections are justified from purely phenomenological perspective and/or from empiricistic and quasi scientific standpoint. Whether consciousness as a property of matter, as a property of protoplasm, as learning, as metaphysical presupposition, as emergent evolution, as property of behaviour or even as a metaphor keeps finding its place in philosophical and non-philosophical discussions. The present volume, the result of a seminar on "Consciousness, Society and Values" is a representation (of almost a fractal kind) that is available in the larger debate on the theme. The discussions on consciousness do not immediately bring the normative dimension, it does surface at the societal level, namely as society having norms. But a full and detailed discussion of the normative aspect of consciousness is possible in juxtaposing consciousness and values. This volume attempts to bring into the forefront the normative and interdisciplinary domains of consciousness. The volume presents papers that deal with consciousness as manifested in the conscious experience, brain-independent or otherwise and methodologically, the contributions represent both the analytic and phenomenological approach on the one hand, and an attempt to go beyond the 'exclusive' approaches on the other. Scholarly contributions that deal with consciousness as embodied in one's introspection and reflected in social and moral values constitute the next set of papers. Studies that reflect on consciousness as expressed in collective consciousness as well as resonated in the communities and specific groups. Find a substantial space in the volume. Studies of moral values reflected both in the philosophical and scientific consciousness of mankind, both from the Indian as well as western perspective constitute the last set of papers of the present volume. 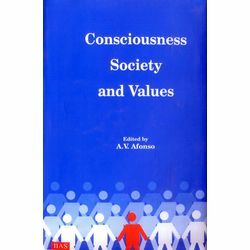 Reflections on consciousness, society and values may take the individual through myriad of theoretical considerations, ranging from purely speculative to the concrete and substantially observable. Such reflections are justified from purely phenomenological perspective and/or from empiricistic and quasi scientific standpoint. Whether consciousness as a property of matter, as a property of protoplasm, as learning, as metaphysical presupposition, as emergent evolution, as property of behaviour or even as a metaphor keeps finding its place in philosophical and non-philosophical discussions. The present volume, the result of a seminar on "Consciousness, Society and Values" is a representation (of almost a fractal kind) that is available in the larger debate on the theme. The discussions on consciousness do not immediately bring the normative dimension, it does surface at the societal level, namely as society having norms. But a full and detailed discussion of the normative aspect of consciousness is possible in juxtaposing consciousness and values. This volume attempts to bring into the forefront the normative and interdisciplinary domains of consciousness. The volume presents papers that deal with consciousness as manifested in the conscious experience, brain-independent or otherwise and methodologically, the contributions represent both the analytic and phenomenological approach on the one hand, and an attempt to go beyond the 'exclusive' approaches on the other. Scholarly contributions that deal with consciousness as embodied in one's introspection and reflected in social and moral values constitute the next set of papers. Studies that reflect on consciousness as expressed in collective consciousness as well as resonated in the communities and specific groups. Find a substantial space in the volume. Studies of moral values reflected both in the philosophical and scientific consciousness of mankind, both from the Indian as well as western perspective constitute the last set of papers of the present volume.